business was to grow when he was contracted to cart mealies amongst other goods for the local Port Sheptone station master. Using the profits he accumulated, and literally sleeping in his truck, he was able to buy a second and then a third truck ensuring that his business expanded rapidly. 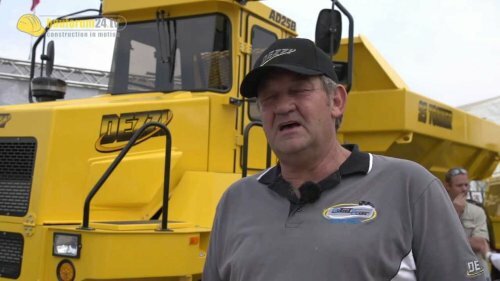 From these beginnings, Gutzeit branched into earth moving after the purchase of a front end loader. This business grew into a successful enterprise in quarrying and crushing stone that also manufactured stone and concrete blocks ' which he sold at the age of 27. Although he was financially well off and able to invest heavily in the property market, it was at the urging and support of his wife Louise that his business enterprises continued to grow. In 1985 he diversified his interest in rebuilding heavy duty equipment and in 1994 started to build his own machines. The first 'Dezzi' built was a front ended loader, purpose built, from designs drawn on paper and manufactured from cardboard template cutouts. Over the years the Desmond Equipment range has grown to 17 machine models that include front end loaders, haulage tractors, articulated 4--4 haulers, articulated 6--6 and 6--4 dump trucks, articulated 4--4 dump trucks, motor grader, cane and timber loaders. Currently, thousands of machines are used around Africa and are found in many ports and in the timber, mining and the sugar industries. Gutzeit said, "We provide a good product and we give a good service. As my late Dad said, if you give a guy a good deal he will come back, if you provide a poor service he will never come back again." The company prides itself on its ethical business practices, which are entrenched in all aspects of the business operation. years. Each machine is a considerable investment by the owner. The second generation of the Gutzeit family is now involved in the transport and motor business. Jade has his own motorcycle shop, sons Carl and Shane act as the general manager and buying director of Desmond Equipment respectively, while Desmond and Louise Gutzeit are the financial directors. Being a family run business has many advantages and is strong source of motivation for the company's success. Desmond Gutzeit emphasized that his wife, Louise, "Believes in me and believes in the magic of family." material such as parcels of steel. The range of machines built is 65 to 85 percent locally made. Currently, the engine and gear boxes are imported, which had a significant impact on profitability when the South African exchange rate recently plummeted. support for the manufacturing sector is also essential for long term sustainability. Gutzeit commented, "Every municipality needs an earth moving machine and we would like to be the supplier of choice." Gutzeit believes that there is much opportunity to export into Africa. At present the company exports machines into Zambia, Mozambique, Ethiopia, Ghana and the Democratic Republic of the Congo. In addition, an equipment order from Russia is currently being filled. motor bikes on the purpose built 2.8 km long Dezzi Raceway. The state-of-the-art track is the only Motorsport South Africa approved track in KwaZulu-Natal and is becoming increasingly popular. Dezzi Raceway hosts a variety of motor bike racing, motor car racing and drifting events and is used as a corporate venue for testing motor vehicles as well as team building events. Gutzeit is optimistic about the future of his company. He said, "I am a South African and my roots are here. In South Africa there are a lot of opportunities and we are certainly going to use these and make the best of them."